When drugs are learned in isolation from their associated diseases, students have difficulty connecting pharmacotherapy, pathophysiology, and nursing care. 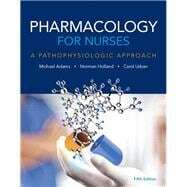 Pharmacology for Nurses: A PathophysiologiApproach, Fifth Edition, helps students master pharmacology by tightly linking it to therapeutic goals and patient wellness. Organized by body systems and diseases, it places drugs in context with how they are used therapeutically. Students can then easily locate relevant anatomy, physiology, pathology, and pharmacology in the same chapter. Nursing Process Application features clearly relate pharmacology to key nursing processes. Features highlighting complementary therapies, community-oriented and evidence-based practices, and lifespan considerations help students make connections to nursing practice. To give readers a clear picture of the holistic nature of pharmacology, the Fifth Edition reflects current pharmacotherapeutics and advances in understanding disease. Michael Patrick Adams, PhD, is an accomplished educator, author, and national speaker. The National Institute for Staff and Organizational Development in Austin, Texas, named Dr. Adams a Master Teacher. He has published two other textbooks with Pearson: Core Concepts in Pharmacology and Pharmacology: Connections to Nursing Practice. Dr. Adams obtained his master's degree in pharmacology from Michigan State University and his doctorate in education from the University of South Florida. Dr. Adams was on the faculty of Lansing Community College and St. Petersburg College, and served as Dean of Health Professions at Pasco-Hernando State College for 15 years. He is currently Professor of Biological Sciences at Pasco-Hernandez State College and Hillsborough Community College. Leland Norman Holland, Jr., PhD (Norm), over 20 years ago, started out like many scientists, planning for a career in basic science research. He was quickly drawn to the field of teaching in higher medical education, where he has spent most of his career. Among the areas where he has been particularly effective are preparatory programs in nursing, medicine, dentistry, pharmacy, and allied health. Dr. Holland is both a professor and supporter in nursing education nationwide. He brings to the profession a depth of knowledge in biology, chemistry, and medically related subjects such as microbiology, biological chemistry, and pharmacology. Dr. Holland's doctoral degree is in medical pharmacology. He is very much dedicated to the success of students and their preparation for careers in health care. He continues to motivate students in the lifelong pursuit of learning. Carol Quam Urban, PhD, RN, Associate Professor, is the Director of the School of Nursing, and an Associate Dean in the College of Health and Human Services, at George Mason University in Fairfax, Virginia. She has been on the faculty at Mason and considers the study of pharmacology to be a course that truly integrates nursing knowledge, skills, and interdisciplinary teamwork. She credits her students, past and present, for providing a never-ending source of real-world stories that make learning about pharmacology enjoyable in class. She has published the Pearson textbook, Pharmacology: Connections to Nursing Practice with Dr. Adams.